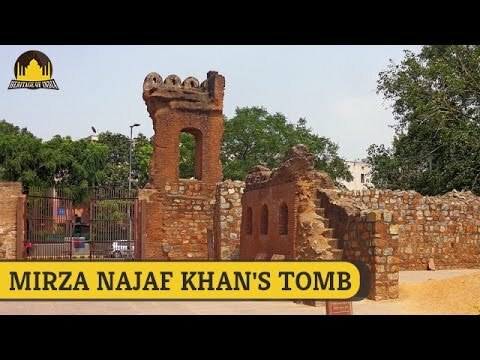 The Tomb of Najaf Khan lies opposite Safdarjung Airport which is situated towards the eastern side of the Delhi-Mehrauli Road and in close proximity to Safdarjung’s Tomb. It is easily accessible by local buses, auto rickshaws and hired cabs. Mirza Najaf Khan was probably born sometime in the year 1722 AD though there is no conclusive evidence to this fact. He was an Adventurer who relocated to India and became a noble in the Imperial courts of Mughal Emperor Shah Alam III. A Persian by native, his ancestry lineage traces back to Prince Safavi, a royal Persian dynasty that was overthrown by Nader Shah in 1735 AD. Mirza Najaf Khan passed away on 26th April 1782 after serving the Country for 42 years and within six years of his demise, the Mughal Empire became feeble when its Military Forces ceased to exist. He never had a son and hence was survived by his adopted son named Najaf Quli Khan, who later, converted to Hinduism and paved his own way and a biological daughter named Fatima. Najaf Khan was buried in a separate enclosure that lies next to Safdarjung Airport in Delhi. His Tomb is constructed in a ‘Charbagh’ or ‘Four-square Garden’ style which is typical of a Mughal as well as Persian style of architecture. There are two marble cenotaphs next to the Tomb site of Najaf Khan with inscriptions revealing that Najaf Khan is buried in one grave and the other is where his daughter, Fatima, lies buried after she died in 1820 AD. The real graves are situated way below (underground) in the heart of the chamber just underneath the raised platform. Today, Najaf Khan’s Tomb is survived by a wall enclosing the Garden area where his Tomb sits and an entrance doorway on the eastern side; all in ruins, however, a newly planted and reasonably maintained garden now dresses the enclosure of the Tomb site. By metro: The nearest metro station is Jor Bagh. Take an auto from there to reach the Najaf khan tomb. 1-There is no charge for anything else (no fee to be paid to the facilitator ). However, tickets for camera etc., to enter any specific monument will have to be borne by the individual. 2-Any sort of soliciting or promoting any product or service among the photowalkers is a strict NO. These photowalks are to encourage amateur photographers and beginners to come out and enjoy photography, please help us maintain the spirit. 4-Please bring your water bottles, shades, and wear comfortable shoes as it will be hot and sunny. 5- Please send 10-15 photos zipped and compressed to virendra@delhiphotographyclub.com after the walk for submission to DPC facebook album.